Adwords can make you and Adwords can break you. When used correctly it can help grow your practice but, at times it can be very unforgiving, and if you take your eyes off it, you can lose your shirt. 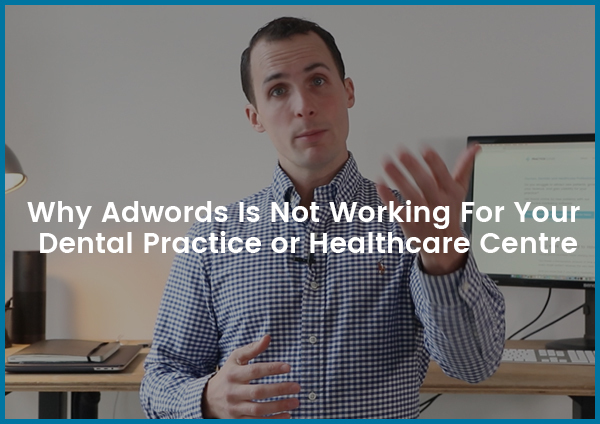 In this article, I’m going to share some of the reasons why advertising with Adwords hasn’t worked for your medical practice, yet. Why listen to me about Adwords? In 2007, I helped co-found a medical center, and we started using AdWords since day one. We’ve spent over $637,000 on Google ads at our practice, it brings us, new patients, every single day. But, we also wasted a ton of money learning what worked and what didn’t, so I want to share these mistakes to help shed some light on why Adwords might not be working for your practice just yet. Not giving yourself enough time testing and optimizing is the first mistake. You can’t just setup Adwords once and hope it works. It’s a continuous process of tweaking, testing, tuning and learning what is working and what isn’t. I’ve spent hundreds (probably thousands at this stage) of hours optimizing and tweaking my AdWords account. Without really focusing on it, you can lose your shirt. If you are starting (or giving it a second try), just start small, place little bets, test, look at the results, optimize and adjust accordingly. Follow that cycle until you see a good return on investment. Using keywords that are too broad or keywords where the searcher is not ready to buy, is another big mistake. For example, let’s say you are a Family Dentist, you might be advertising on the keyword “Dentist,” and while, yes, you are a Dentist, the term probably won’t convert well because it’s too general. Someone searching for just “dentist” could be looking for “Dentist schools, Dentist jobs, Dentist jokes, Dentist costumes, Dog Dentist, Dentist Wikipedia page, etc.” so for us to know the intent behind the search of “Dentist” is quite hard. With a phrase like this, it’s easier to determine to search intent. We can tell it’s someone who is ready to pick up the phone and make an appointment. So while the search volume is much lower on a phrase like this, advertising on this phrase would probably lead to a better return on investment. Thinking about the intent behind the keywords you use will help narrow down what to focus on. You always want to be using negative keywords for your Adwords campaigns. Negative keywords are terms that when someone includes them in a search phrase, your ads won’t show. It’s a great way to avoid having your ads showing for searches that are not relevant. If someone is searching for “free dentist,” and you have “free” as a negative keyword, your ads will not show up in that search. Or some others might be “jobs” or “school,” when someone is searching “dentist jobs” or “dental schools” your ads again won’t show up. Saving your money to spend on more relevant clicks. Using negative keywords is a great way to filter out unrelated searches and focus your AdWords account. Mistake 4: Not Tracking Conversions. I can personally attest that not tracking conversions cost me $10,000s of thousands of dollars in wasted advertising spend. If you are not tracking conversions, there is no point in advertising on Google. Conversion tracking is just a simple piece embedded on your website, which helps track what happens after a client has clicked or saw your ad. It tells you which ads and keywords have lead to a phone call, an email, purchase of a product, a sign up for your newsletter, etc. In short, it tells us what keywords and ads have a positive return on investment. Without tracking conversions, you are flying blind. We want to send our paid traffic to specific and relevant landing pages. If you just send them to your homepage, it’s probably not going to be specific enough to help the patient. For example, if you are advertising teeth whitening services, you want to send them to your teeth whitening service page, If they are searching for pediatric dental check-ups, you’ll want your ads and landing page to be only about pediatric dental check-ups and not to your generic homepage. Being as specific as possible between your keywords, ads and landing pages is a best practice here. The majority of searches today are happening on mobile. If your website isn’t optimized for mobile, you are leaving money on the table. Make sure your website and landing pages work correctly on Android and iOS phones. Keep a “mobile first” mindset when you’re thinking about your website. This may seem counter-intuitive, but by bidding on your own brand name, you’ll get cheap clicks and a high-quality score which will bring up the overall score of your account. A little bonus tip is that you could even bid on the names of your competitors. Chances are they are doing it to you, so it helps to level the playing field. Doing these things will help you get a much better ROI from your Adwords spend. So, what are some mistakes you’ve made with Adwords?